As Senior Airman Matthew Garza concluded his opening speech, three musicians, dressed in dark blue Air Force uniforms, walked in unison toward center stage. Members of the audience who may have expected more traditional renditions of military marches like “You’re a Grand Old Flag” were greeted instead by a fun and lighthearted number that set the tone for the rest of the recital. The United States Air Force Band of the Golden West performed a chamber recital in Knuth Hall at SF State Friday, Sept. 27. While the music was dominated by woodwind instruments, the performers played a variety of musical styles including classical, folk and romantic. The band was approached to perform on campus by Martin Seggelke, a music professor at SF State whose expertise in wind ensembles and his professional relationship with members of the band led him to extend the invitation. The music that the USAF Band of the Golden West plays is usually predetermined by the Commander, in order to ensure that the music properly suits the different types of proceedings the ensembles play. But Garza, the band’s trumpeter, proposed the free-form recital series to the band Commander, Capt. Jason S. Plosch, as a way to not only empower the musicians but to also challenge them. From there, the musicians took an interest and organized their own ensembles in order to perform the music they are passionate about. “I may reach out through email and say ‘Here’s our particular dates for the recital series, if you would like to participate let me know,’ and people kinda do their own things,” said Garza. 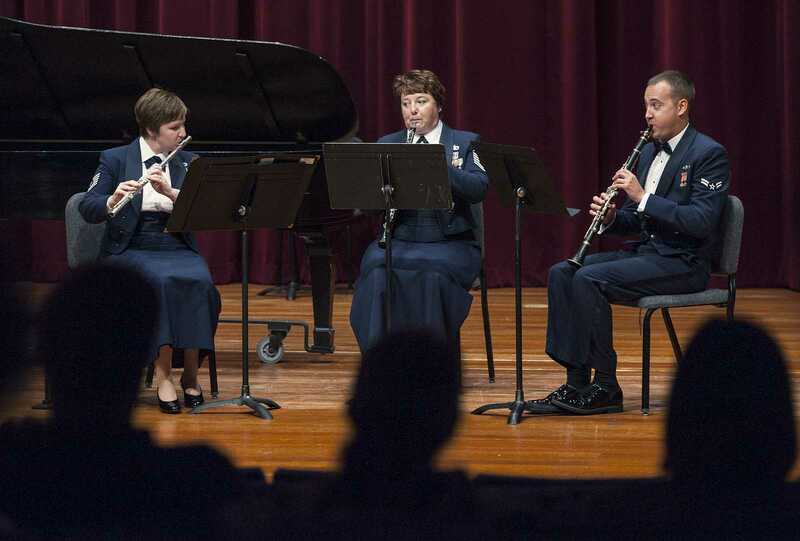 The recital series is just one of many events that the Air Force band performs. Being the only active Air Force band west of the Rocky Mountains, the band currently serves 13 Air Force Bases, 8 Air Force Reserve Wings and 6 recruiting squadrons along the west coast, as well as sending groups to occupied military zones to entertain and support our troops. The Air Force band not only entertains both current and veteran members of the military, but is also used as educational and promotional tools to members of the community. While formal ceremonies require the band play more traditional military tunes, Friday’s recital allowed for more creative freedom. While the band fulfilled the high standards of professionalism and conduct set forth by military personnel, there was an element of leisure and fun that was evident by the audience. “(The recitals) are a little bit more laid back, just because we get to be more in charge of it ourselves,” said Master Sgt. Coreen Levin. “I want more musical things people are going to remember, you know with that nice Malcolm Arnold, it’s just very catchy, and uplifting and fun. That’s what I like,” said Levin on her musical choice for the evening. While budget cuts currently restricts the Band of the Golden West from touring outside their local area, they currently have many concert appearances set throughout the Bay Area over the upcoming months.